Amazon India now start kindle unlimited in India. This mean you can enjoy the freedom to read over 1 million book titles (including my book) on any device at just Rs.99 a month, for a limited period. Just spent INR 99 to join kindle unlimited and read 1 million books (including my book) for one month. Why I allow this free version ? can I get a royalty on this free buying. Answer:- Ha Ha Ha.. 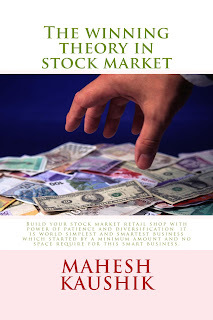 I believe to get money from stock market not from book royalty. I have subscribed kindle for your book. I have read your book. I am from bikaner rajasthan.please register me. Mahesh Sir i am send you forward email from my wife email id and also cc mark to me. my mail Id is vazeravi@gmail.com. I have purchased your book " The winning Theroy in Stock Market" from amazone as kindle edition. Now i Want to register with you so that i can ask you the question on the blog. I have amazone mail of subscription to kindle unlimited. Please register me so that i can ask question and post reviews. I have forwarded the Amazon mail to you for proff of buying your book in online. Please register me so that I can ask some questions. I went through your book and trying to apply those concepts on Coal India. So I was taking average of Base Price, Book Value and net revenue per share. The final result which is discounted by 20 % of average doesn't match up with price trend of last 5 years. Please let me know if something went wrong in calculation.